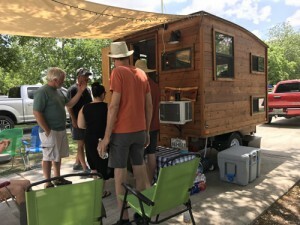 The weekend of May 17-20, around 40 trailers gathered at Johnson Creek RV near Kerrville for the Texas Tiny Trailer Rally. This rally is held twice a year (Spring and Fall) and is open to anyone and everyone who haves or loves tiny trailers. We had a great group of people this year, including a lot of newcomers, to our group and to tiny trailer camping. We had 3 vintage tiny trailers, and 2 home builds join us as well. We started the rally off with a weenie roast Thursday night. Traditionally, the roast has been over a campfire so that they, well, roast! The weather had us a little defeated though and everyone opted for a more air conditioned hot dog ‘roast’ inside the rally hall. Friday morning was coffee with Keith and his vintage 1966 Cardinal Lovebird. 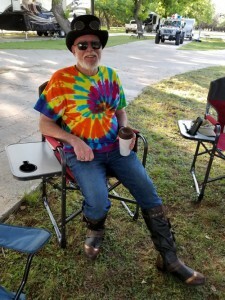 Wearing his steampunk hat, Keith showed us around his peaceful trailer and outdoor space set up, which made you calm enough to think you are drinking decaf! Tech talk kicked off in Western Town, an adorable little meeting hall that was decorated to look like an old Texas town. During Tech talk, we discussed everything from batteries ( a tech talk favorite subject) to solar, converters to gadgets. Look for our “Favorite Gadgets” blog post coming soon! Camper tours are often the favorite part of every rally, and this one did not disappoint. The clever storage and decorating ideas that these campers have is astounding! From the hanging baskets in Amy’s T@G to the SOMETHING ELSE I CANT THINK OF, the creativity was overflowing! 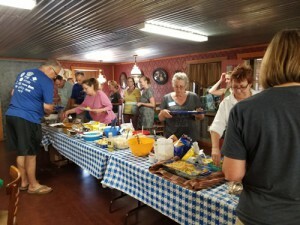 Friday evening we all gathered around in Western Town for a nice pot luck dinner where there was more delicious food than we could possibly eat! After everyone was nice and stuffed, we spent the evening listening to music, playing Right, Left, Center, and painting rocks. Yes, painting rocks. We had to put these campers’ creativity to good use! Sitting around with a glass of wine and painting rocks with your new camping buddies, well, there is just nothing else like it. Saturday starting with more coffee, this time with Bob and his dog Ranger and their T@G Outback. More Tech talk, and more camper tours. We had a lot of people who were on their first trip in their trailers, or just beginning the tiny trailer life. We love having newbies at the rally so they can really see the potential of their tiny trailers, as well as gain confidence with towing, unpacking, and off-roading with their trailers. Next, we headed to Western Town for a beer and wine tasting! We had a little of everything, and something for everyone. There’s nothing like a cold drink after touring campers in the sun! Saturday evening we had a delicious enchilada dinner prepared Jackie Buerger and volunteers. 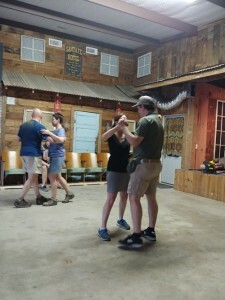 As always, Saturday night was capped off with some foot stompin’ bluegrass music and dancing! Our awards this year were well deserved and went to the following people: Susan for her Outstanding Outdoor Space for her yellow T@G, Amy was the Master of Mods with her creative Harry Potter T@G, Lynn was the Greatest Glamper in her 1965 Airstream Caravel, and Buck and Melissa was the most Vibrant Vintage with their beautiful 1965 Aristocrat. Some of us just we not done partying so we headed to the annual Bean campfire! The Beans are gracious enough to host our campfire every year, whether it’s planned or not! A beautiful lightning show took us into the night until we ran to our trailers as the rain starting coming down. Sunday morning we gathered once again in Western Town for some pancakes, sausage, and the final goodbyes. The amount of volunteers we had at this rally was outstanding, and it certainly would not have been the same without them. From scrubbing dishes to entertaining kids, everyone lent a hand and made this rally one for the books. I am always impressed with the sense of community at these events, among total strangers. People are excited to lend a hand, offer advice, or just sit around with a cold beer and talk. Tiny trailer traveling can get a little lonely, but at the Texas Tiny Trailer Rally, everyone is family. We cannot wait to do it all again October 18-21 at Johnson Creek RV. To stay informed with rallies and other events, check our website and like us on Facebook!